Sailing into the open ocean is not only an exciting experience, but also an unknown; you never quite know how the ocean will behave. With the sheer size of the oceans covering nearly 71% of the world’s surface, there is an awful lot of ocean to explore whilst sailing. Did you know that the oceans provide over 97% of the world’s water supply as well as half of the oxygen that we breathe? The world’s global ocean is so huge, that it has been divided into 5 individual oceans which are all connected. The largest ocean out of the 5 is the Pacific and is roughly the same size as all the land on earth, pushed together. Did you know that 1% of the ocean floor is covered with coral reef? Every year around the Christmas months, approximately 4000 to 5000 sailors will cross the Atlantic Ocean from Europe to the Caribbean, on one of the biggest adventures of their lives. The Atlantic Ocean is the second largest ocean after the Pacific Ocean and covers nearly 25% of the world’s surface. 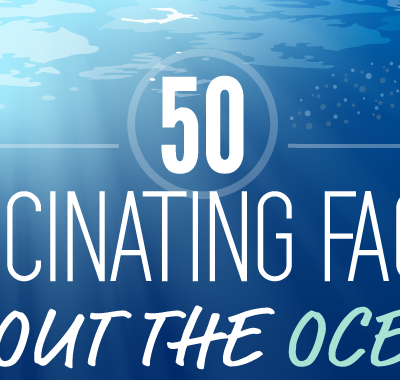 If you would like to learn some more incredible facts about the ocean, that sailors love so much, then take a look at the infographic below which will provide you with some jaw-dropping facts, from the makers of divein.com.